About 15 years ago, Peter Lloyd hurt his back while working on the grounds crew at Western Carolina University. He visited the doctor and chiropractor, got an MRI and was prescribed Percocet, a powerful painkiller that can also be highly addictive. Lloyd’s doctor told him to come back the next month if he needed a refill to relieve the pain from the ruptured, or herniated, discs in his back that were crushing some nerves. After a surgeon told him an operation held only 30 percent chance of success, his family physician referred him to a pain clinic. Nearly 25 million people in the United States live with chronic pain and for years, opioid prescriptions were recommended as a treatment option for patients with chronic pain. While the drugs dulled the pain, he slowly found himself with an even bigger problem on his hands. Lloyd became part of a familiar and tragic American story of people entering endless cycles of opioid misuse, causing them to lose their jobs, families and even their lives. In Lloyd’s case, he ended up homeless and living in his truck. Today, the 41-year-old Lloyd has a new job, a promising new life with a baby and fiancée and two years of recovery under his belt. His story shines a light on a path that experts say shows hope for people trapped in the devastating misuse of opioids. When Lloyd first went to the pain clinic around 2008, the physician prescribed more Percocet to treat his pain. Lloyd was soon taking a couple hundred milligrams of morphine and Percocet a day and was “appreciating the buzz.” At the same time, he found he could not stop taking them. The physical dependency was real. Lloyd sometimes took more medicine than he was prescribed and eventually failed a drug test at work. This triggered a letter to his pain clinic, which stopped refills. Lloyd’s boss was understanding and gave him time off to withdraw from his medication at home. But Lloyd knew this wasn’t a permanent solution. He eventually lost that position and started bouncing from one job to another as he continued to struggle with misuse. He’d try to beat it with sheer willpower, but the drugs were too powerful. He lost relationships, jobs, and ended up homeless for the better part of a year – so he lived in his truck. He finally ran out of money, his truck was repossessed and he had to live with a friend. When he felt like he had nowhere else to turn, Lloyd began having suicidal thoughts. He said the homeowner had a closet next to the front door with a rifle in it. He was placed in a nine-month inpatient rehabilitation program. In 2014, that friend helped Lloyd get a job with his family’s business in Eden. After working with that business for a few years, Lloyd got another job at an auto parts manufacturer in Reidsville. Lloyd, who makes friends easily, quickly got to know a lot of people in his new town. That included people who were looking to get high or to sell drugs. He quickly fell back into using opioids. In the meantime, Lloyd ended up injuring his back again. 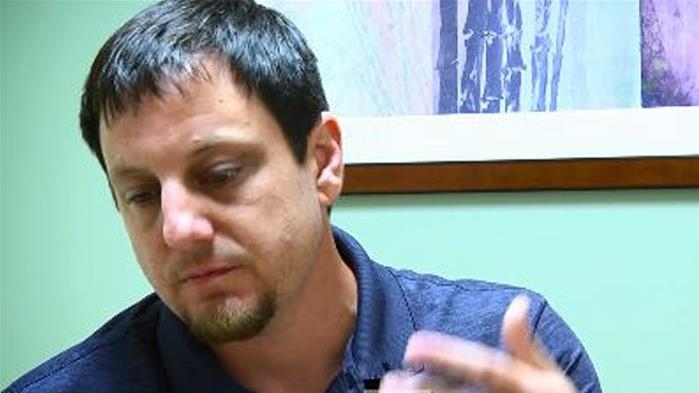 He went to an urgent care clinic and was prescribed hydrocodone, but knew it wasn’t what he needed to fix his situation. In 2016, Lloyd wanted to learn what was wrong with his back and landed in the office of Dr. Kip Corrington of Novant Health Northwest Family Medicine in Oak Ridge, North Carolina. After hearing Lloyd’s story and reviewing his medical history, Corrington thought Lloyd would be a good candidate for Suboxone, which is a partial opioid pain reliever that can help patients break their dependency on opiates. In 2017, 18 percent of Novant Health patients diagnosed with substance use disorder benefitted from treatment with drugs like Suboxone. It’s part of an emerging new form of opioid abuse care known as medication-assisted treatment that is starting to gain favor across the U.S. The goal of medication-assisted treatment is to help patients recover through an individually tailored treatment plan of medication and counseling, or behavioral therapy. It has been shown to improve patient survival, increase retention in treatment and increase a patient’s ability to gain and maintain employment. Since Lloyd started treatment with Suboxone nearly two years ago, he’s been promoted at work and just had a baby, Finn, with his fiancée. Lloyd describes Suboxone as a way to treat his physical dependency. But he doesn’t want to credit the drug with all the good things that have happened in his life. “I’ve put a ton of hard work into this,” Lloyd said. “Suboxone has been part of my rehabilitation process, but there’s a lot of internal work that needs to be done besides taking the drug.” Lloyd has taken steps to address the mental health side of dependency as well – completing intensive inpatient rehabilitation and cognitive behavioral therapy. Lloyd’s advice to others in similar situations: Be ready for recovery and commit to it. For more information about Novant Health’s opioid stewardship efforts, visit NovantHealth.org/opioidstewardship.